In Windows operating system, such as Windows 10, Windows 8.1, Windows 8, Windows 7 and Windows Vista, file type or file extension associations determine what’s the next course of action (specifically what application program been used to open a file or document, or what command to run) when user double clicks on the file or shortcut icon. By default, most file extensions or file types are been associated with various Windows built-in apps, tools and utilities. For example, .txt is associated with Notepad, .jpg with Windows Photo Gallery or Photos app and HTTP Protocol with Internet Explorer or Edge web browser, depending on the version of Windows OS you’re using. Beginning from Windows Vista, things regarding file associations have changed considerably from Windows XP, with noticeably missing File Types tab in Folder Options dialog. The GUI and process for changing default apps for file types change again with the arrival of Windows 10. For user who wants to change default app association for particular type of files so that it can be opened or ran using other program that doesn’t register its supported file types association automatically, or to revert and restore file association which has been hijacked by newly installed program, changing the default app, file type or extension association can be done manually. In addition, in Windows 10, application no longer able to ‘steal’ file type association to become default programs for certain protocols or file types during installation or from in-app. 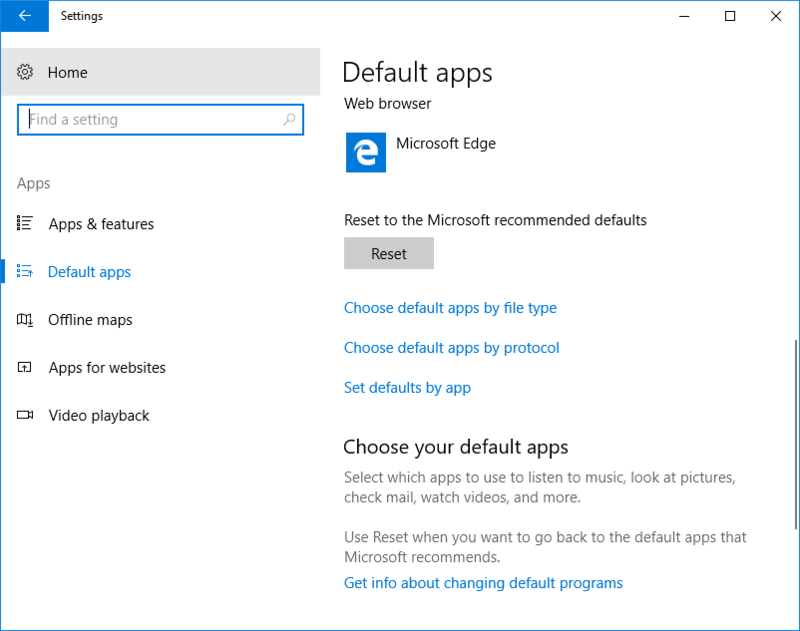 Windows 10 users must explicitly configure and set a program to be the default app in order to change the default app settings. Right click on a file with the type or extension that want to change its associated application program. Select Properties on right click context menu. In the General tab, click on Change button. In non-Windows 10 OS, an Open With window will appear. Choose a program to open the kind of file from the list of programs available. By default, Recommended Programs is automatically expanded. However, there is more detected programs in the section of Other Programs, which can be expanded to select by clicking on Down Arrow at the end of the separator line. If the program that you want to use as the default program does not found, click Browse to select an executable file manually. 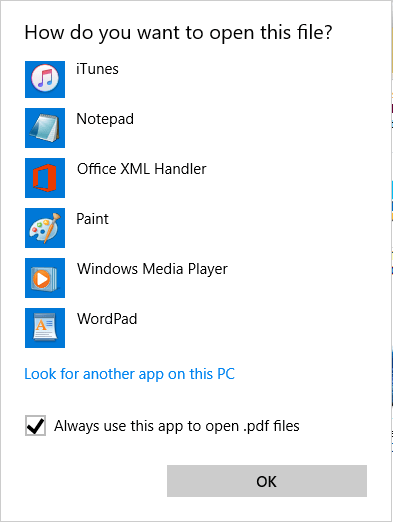 In Windows 10, the program listed “Keep using this app” is the current default associated with the file extension. If you want to change to another application, choose one under “Other options” or “Featured in Windows 10”. You can click or tap on More apps to view more programs installed on the PC. If the program that you want to use as the default program does not found, click Look for another app on this PC to select an executable file manually. 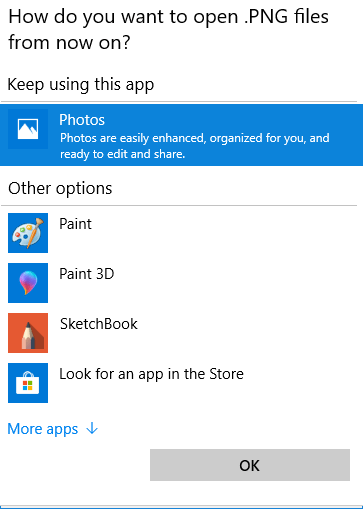 Windows 10 also comes with the option of “Look for an app in the Store”, which will launch Microsoft Store (previously known as Windows Store) to search for apps that able to handle the file extension. 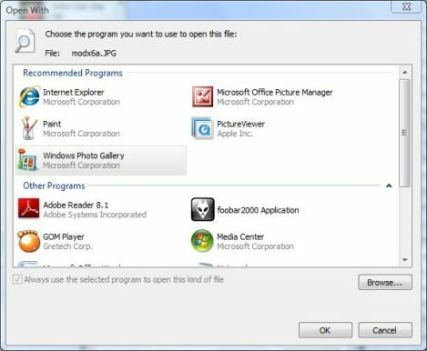 Note that this method works if only several programs have been used to open and run the particular kind of file type extension previously, or Windows has the register that knows what file types programs could handle. Point to Open With on right click context menu, and then select an app that you want to assign as its default app handler. If your preferred app is not listed, Choose Default Program or Choose another app (in Windows 10) to view more listing. An Open With window will appear. Choose a program to open the kind of file from the list of programs available. By default, Recommended Programs is automatically expanded. However, there is more detected programs in the section of Other Programs, which can be expanded to select by clicking on Down Arrow at the end of the separator line. Windows 10 pops up How do you want to open this file? instead. The program listed “Keep using this app” is the current default associated with the file extension. If you want to change to another application, choose one under Other options or Featured in Windows 10. You can click or tap on More apps to view more programs installed on the PC. If the program that want to used as the default program does not found, click Browse or Look for another app on this PC (in Windows 10) to select an executable file manually. Windows 10 also comes with the option of “Look for an app in the Store”, which will launch Microsoft Store (previously known as Windows Store) to search for apps that can handle the file extension. Check and tick the checkbox for Always use the selected program to open this kind of file or Always use this app to open .file_ext files option. Click OK button. The file association will be set, and the file or document will be opened using the new default program automatically. Open Control Panel. Then go to Programs and click Make a file type always open in a specific program. Alternatively, in the Classic View, open Default Programs and then click Associate a file type or protocol with a program. In the Set Associations folder, locate and highlight a file type by extension or protocol, and then click on Change Program button. If the program that want to used as the default program does not found, click Browse to select an executable file manually. Open Settings -> Apps -> Default apps. Open Choose default apps by file type to set file association by file extesion or Choose default apps by protocol to choose default app for protocols. Scroll to the extension or protocol which you want to change its default app handler, and click or tap on the current default app or “Choose a default” located to the right. Select an app from the list as the default app. Note that you can only select the default app from the list provided, or “Look for an app in the Store”. Manually selecting an executable or program is not supported yet. So far, Windows built-in changing and set file type associations methods only allow user to change default program used to open or run a file or document based on its extension (or protocol). For complete control over the file types, such as assigning and associating different programs to different context menu entries for the particular file extension, third-party tools are required. Here’s a list of file extension and file type management utilities available for user’s disposal.